If your garage is full, or you need room for multiple vehicles, it can be difficult to get the necessary protection. 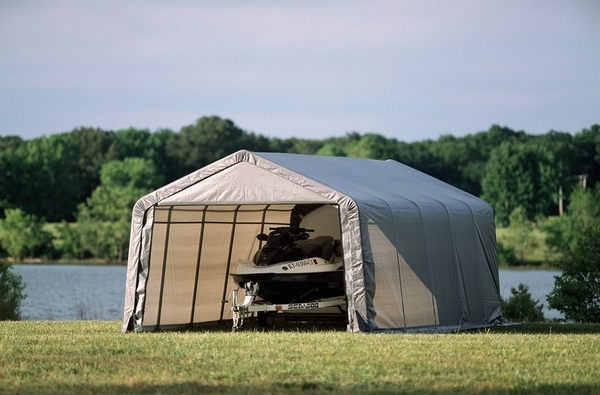 With this portable garage from Shelter Logic, you can store multiple vehicles or a small boat. The thick lining keeps out moisture and protects from inclement weather, and the durable frame protects your vehicle when there are strong winds. An outdoor garage is a great way to get the protection of a garage without having to add onto your home or build a separate garage. 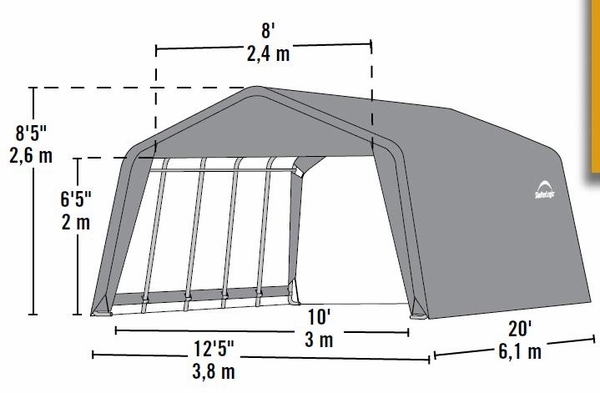 Do you have a zippered end panel for this canopy? I apologize but we do not currently carry that panel. You can get it directly from the manufacturer. We bought one of these nearly two years ago, and the cover is completely shredded. Can something be done about this? You can purchase a replacement cover directly from the manufacturer, Shelter Logic. I just bought a 10x20x8 portable garage in tan. I went with the upgrade of 14.5 mm thickness - very strong. It will last 10 years for sure. Nice people to do business with- I will be a return customer. I called with a small problem, and it was cleared up within one hour. The ordering process was straight-forward and clear. The canopy arrived sooner than expected; the delivery service chosen actually unloaded the heavy packages (3) right at my door. Set up was not difficult, even in freezing weather. A couple of bolts "short of a canopy" but otherwise complete. Pleased with the result. ProsGood ordering process. Speedy delivery. Manageable set-up. Pleased with the final product. ConsSet-up instructions could have been a little clearer. A few bolts were missing but easily replaced. It took me about 9 hours to put this shelter up by myself. The more the weather hits it, the more confident I am in the construction and quality. I am in South Dakota, and the wind has hit this shelter particularly hard the last three weeks. The six 30 inch anchors have been more than adequate to the task of keeping this from becoming a box kite. The frame is strong and easy to assemble. Assembly would have been much quicker with another set of hands and a calm day. Assembly in general was easy, but I short this package a star for the instructions. They used generalized illustrations rather than illustrations particular to my product and in some cases an illustration would show a step completed that was later in the steps. This caused me to have to stand back and try to figure out what order made sense. If you follow the steps (not the pictures) to the letter, you will be fine. As with any assembly of this type, some tools and handy-manliness are required. If you've never put anything big together before, or if you are easily perplexed by LEGO kits, this is not for you, or you should allow yourself lots of time. With a few kids, this could be a great family project. ProsFrame easy to assemble. Very strong, Anchors more than adequate to the task in moderate to high wind.